This course provides an introduction to criteria for the design of heating plant instrumentation. A heating plant may contain one or more boilers. The plant may be an individual plant serving a single building or a compact group of buildings, or a central plant serving many buildings and facilities through an extensive distribution system. The heating plant instrumentation discussed is, in general, for a saturated steam power boiler heating plant. The information provided may also be applicable to Low, Medium, and High Temperature Hot Water heating plants, but does not cover all of the requirements of those plants, such as control of water pressurization and circulation systems. The information may also be applicable to superheated-steam power plants, but does not cover the all of the requirements of those plants, such as steam extraction, reheating, steam turbine control, and cooling water controls. 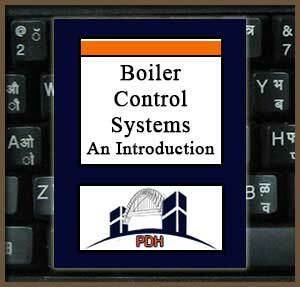 Learn about heating, high pressure and power boiler controls. Learn how to choose the type of control that will do the job most economically over the lifetime of the equipment. Learn how to assure compatibility with controls used in an existing plant, ease of operation and maintenance, and plant personnel familiarity and training. Learn how to apply pneumatic, analog and digital control systems. Learn about design issues at the electrical interface between instruments and a digital controller. Learn about complex boiler control systems that may involve multiple digital control systems (e.g. DCS, PLC, or computer controlled smart instruments) linked together by a communication data bus. This course is intended for mechanical and electrical engineers and other design and construction professionals wanting to learn the fundamentals of heating, high pressure and power boiler control systems. This course will give mechanical and electrical engineers and other design and construction professionals an introduction to the types and application of control systems for boilers and boiler plants. This course provides introductory information about selection, application and design of pneumatic, analog and digital control systems for steam boilers. This course will give you professional tools that will help you to understand the technical and design issues that need to be addressed to design systems for control of boilers and boiler plants.